Many people feel that just a little garlic in a dish is the best way to use this wonderful bulb. I tend to think otherwise. This recipe is a prime example. In actuality, too much garlic should be viewed the same was as too much basil, as in pesto – if you get my drift. Pesto is essentially way too much basil whirred up into a paste. The sheer amount of basil transforms it into something altogether different than how one leaf tastes. Roasting garlic mellows and softens the flavour. This is exactly the same as garlic, and is doubly true when you roast with garlic. The longer you cook the garlic, the less it will taste and smell “garlicky” and the more creamy and subtle the flavor becomes. The health benefits of garlic have been known for a long time. It was one of the first foods to be recognized for potential medical properties besides nutrition. One proven benefit is garlic’s natural antibiotic capabilities (hence the folklore reason for warding off colds and the flu). Another is its powerful antioxidant effects. Antioxidants help battle damaging free radicals. Aged garlic cloves are even better in this regard than normal cloves. This recipe is simplicity itself and uses a heck of a lot of garlic. The end result is a golden brown chicken steamed through with the most wonderful gentle garlicky taste you can imagine. Save yourself some work. Double duty the oven by roasting side dish vegetables at the same time and you have a meal that you can just put in the oven, set the timer and forget. At 375°F most vegetables (potatoes, carrots, turnip, squash, etc) will cook in about 1 hour to 1 hour 15 minutes. A small chicken roasts in the same timeframe. Just toss the vegetables with some olive oil, salt and pepper and spread out in a pan. Sprinkle with herbs if desired. Throw in some additional garlic bulbs to roast exterior to the chicken. 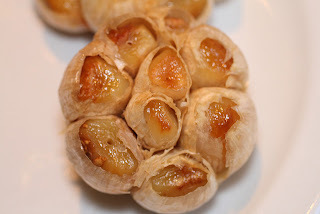 Roasted garlic cloves are amazing mashed with roasted potatoes and a little butter. Actually they’re amazing in so many places… on pizza, in bread, soup… anywhere a sweet intensity is needed. 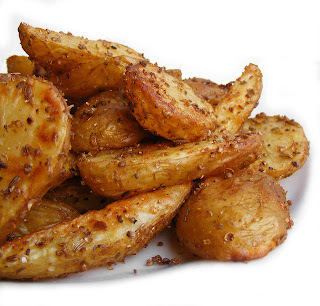 Roasted potatoes are a perfect side dish when roasting a chicken. Trim the tops from the garlic heads with a sharp knife, but keep the bulbs whole. Stuff them into the cavity of the chicken. Mix the herbs with the butter. Loosen the chicken skin over the breast and legs. Try your best not to rip it. Rub the butter between the skin and the meat. Rub the outside of the skin with a bit of olive oil. Sprinkle the exterior with salt and pepper. Place the chicken in an ovenproof pan and position it on the centre rack of the preheated oven. 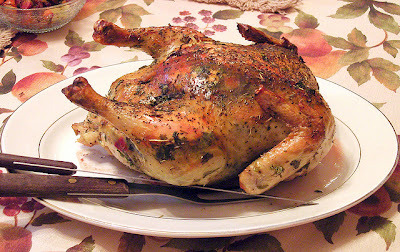 Roast the chicken until the internal temperature of the thickest part of the meat (breast or leg) registers 180°F. Use a thermometer. There’s no sense taking chances with undercooked chicken. Serve with the roasted vegetables for a hearty Fall dinner.